Crowthorne, near Reading, Berkshire, UK. RG45 6TU, close to Surrey, Hampshire borders. in Ramsdell, near Basingstoke, Hampshire RG26 5SL. 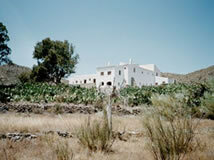 The Cortijo El Saltador, is a large traditional farmhouse for holidays or groups to use as a center for activities. It is part of an old trainline used by the mines, which was decommissioned in 1943, and connected the nearby village of Lucainena de las Torres with the part of Aguamarga. El Saltador (the jumper) with 55 hectars of land lies in the foothills of the Sierra Alhamilla, a magical desert landscape. Using the existing walls, the house was restored between 2001 and 2003 with the help and the enthusiasm of workers and volunteers from all over the world. The guestrooms surround a light open courtyard and in the mainhouse there are a seminarroom, a library, a spacious kitchen, an open outside eating space and several communal rooms to be used at your leisure. A second seminarroom which is independent from the house is also available for training activities. The house uses its own well water and is supplied by a big solar system. It is a place of silence, reflection and relaxation in a beautiful setting close to nature. Feb 11 - Feb 24 - Away for Training. Psychopomp: variable, depends on time etc. Power Objects: depends on time, weight, distance etc. 2-3 days personalised intensive healing session for small groups of 1-3 participants. One weekend per month in UK. Languages: English or German. Prices are donations only. You pay according to your ability to pay, you decide how much it is worth to you. Full details on application. Please contact me via e-mail for futher details.